It’s a classic Porsche lover’s paradise. It’s also a place where you can look but you can’t touch — unless you’re willing to pay to play, of course. We’re not in the business of selling any Porsches here at HOUSE Automotive, though we’d be lying if we said that we don’t window shop at classic Porsche dealerships from time to time. This is the subjective pinnacle of automotive aesthetic perfection, so really, can you blame us? Speaking of pinnacles and automotive aesthetic perfection, that’s exactly what you’ll find at Porsche’s upcoming 70th Anniversary Auction in Atlanta, Georgia. There, you’ll be able to gander and bid on some 123 lots of classic Porsches so expensive that we’d rather not work on. What we can work on, however, is your Porsche (unless you’re driving a 1980 Porsche 935 Kremer K4). Whether you’re due for routine maintenance or your 911 is throwing you a little shade and you’re in need of a full-on repair, HOUSE Automotive is the number one choice for Porsche service in Los Angeles. Read why countless people agree with that claim by visiting here! Let’s take a look at some of the beautiful vehicles that will be auctioned off later this month. The 959 Paris-Dakar is so incredibly expensive because this particular one is only one of three built in 1985. Of those three, this is the only 959 to survive. Unfortunately, the other two suffered accidents that rendered them totaled; even this 959 sprung an oil line failure and forced the drive, Rene Metge, to end the Dakar journey early. We’re not joking when we say that this car was found in a barn. Apparently, it’s not uncommon to discover rusted yet quite valuable vehicles locked inside a shed that were long forgotten. People have even found practically unused, undriven vehicles that are now 60-70 years old. In the case of bidding on this 356A, you’re not purchasing a car so much as you’re buying a piece of history and a story to accompany it. Though the story behind this lot isn’t all that exciting, a barn find in the vehicle auction world means big money, and that’s why we’re looking at a pre-auction estimate of around $125,000-150,000. Dubbed the “college professor’s car” by many due to its sensible nature and reasonable performance yet still being a quirky model that most people would never think about owning. Most academics wouldn’t even consider spending the majority of their salary on a 911, anyway. We’ll say that this 944 is a lot more modest in terms of the 356A and 959 Paris-Dakar, and by “ a lot more modest,” we mean that the 944 is practically a steal in comparison. With a pre-auction bid of $35,000-45,000, we’re sure that this pristine red 944 will go very quickly. From 1984 to 1999, only 10,262 miles were put on it and from there it became a fair-weather driver only. Porsche purists appreciate the 944 for the authentic driving experience and classic Porsche looks and we know that they’ll appreciate this gold standard of a 944. Have you ever thought to yourself, “I really want to own a German Batmobile that not even street legal”? If so, this is the vehicle for you, so long as you can dish out the $850,000-1,100,000 for it (and that’s just the pre-auction estimate; it’s likely that this Kremer will go for more than that). This car shares heritage with the K3 that won the 1979 Le Mans overall. These days, there are few things reminiscent of 1980 with the exception of the styling on this lot. After being in storage for several years, this Kremer was restored in 1997 to race in vintage categories, but that’s not all. It was privately purchased and received all-around mechanical upgrades that put the K4 up to modern standards — a stiffened chassis with bonded-in honeycomb aluminum, a new twin-turbo, Penske shocks, and the works. In 2003, another owner took this Kremer under their wing, but now it’s up for sale. This won’t mean much to those who don’t care, but if you’re looking for quite possibly the fastest and most updated Kremer 935s in existence, this is it. This one is an interesting bit because it’s not motorized, it’s not meant to be driven, and it’s meant for a child to sit in and enjoy. It’s probably a good thing that there’s no motor in it, then. As the ultimate pretend vehicle, bidders are still looking at a considerable pre-auction estimate of around 50-60k. We’re not sure who’s willing to shell out that much money as a Barbie Jeep is a steal in comparison. We’re kidding, of course, but it’s interesting how much a children’s car can really go for. Stay Tuned For More Porsche News From HOUSE Automotive! 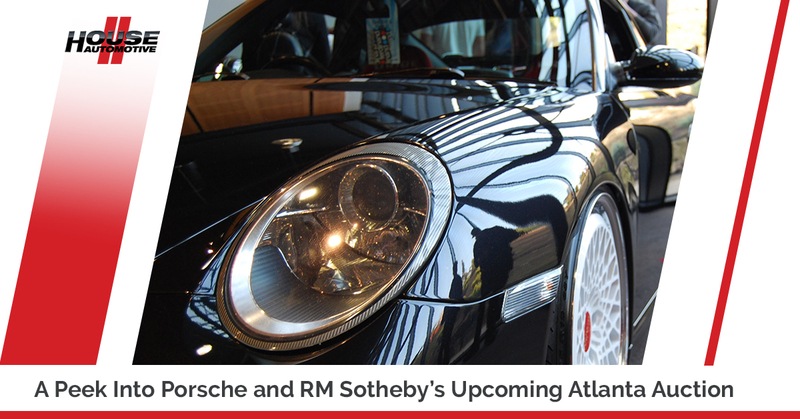 We can’t promise that we be in Atlanta later this month to attend this legendary auction, but if you’re interested, know that you’ll be a part of what many believe is the largest Porsche-only auction in history. With a unique and rich backstory to most of these vehicles, it’s our pride and joy to work on this brand. Even if you don’t drive a classic Porsche, we’re still interested in holding your vehicle with the same attention to detail as we would with any of these models. If it’s time for Porsche service, don’t wait. Schedule an appointment with HOUSE Automotive today for independent Porsche service in Pasadena that you can count on.